This article is meant to assist you with an overview of the Configurator. 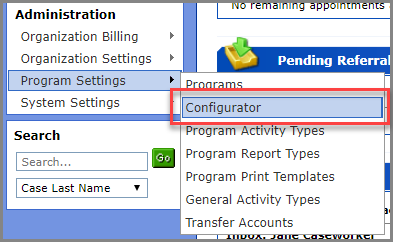 The Configurator, is a consolidated list of your agency’s configuration of Program Activity Types, Report Types, and Print Templates. The Configurator allows you to see all of these items in one list and sort them in different ways. You must be an Agency Administrator to access the “Administration” menu on the left side of your Workspace. Go to “Program Settings” and click on “Configurator”. Hover over the “Show” button in the action bar, to select how you would like extendedReach to show you your agency’s configuration information. Hover over the “Add” button in the action bar, to add a new Program Activity Type, Report Type, or Print Template. The titles below the action bar across the top of your screen, describe the information you are seeing below each Column Title. 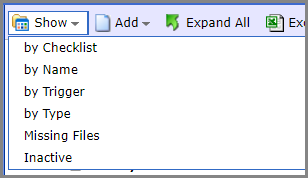 Click on the “paperclip” icon in the bottom box (top left corner) to attach the form template. If there is no paperclip, make sure that the “Template Type” is “File – Use Field Codes”.